In the wake of several highly reported rapes, the brutal attack on Anene Booysen and the recent killing of Reeva Steenkamp, many South African’s are asking themselves, “What can we do?” Wearing black, protesting on social network platforms, and even calling for higher penalties on convicted offenders all have their place. But how about we went a step further and started targeting the opinion-makers, the places where mindsets and attitudes are being sculpted, the voices that are headline-by-headline daily erroding our country’s sense of value for life, desensitising us to violence and degrading women? How about flooding The Daily Voice and Die Sun papers with letters of protest around their irresponsible reporting, sensationalist stories and shockingly offsides headlines that devalue life and women and increasingly create spectacle out of tragedy? While letters to the Editor are certainly a start, I’m guessing we’re going to have to go a couple of steps further. Let’s be honest: folk who write a letter of protest against insensitive headlines are not generally the people who are buying The Daily Voice. With a daily readership of just over 500,000 even a deluge of outrage may not affect The Daily Voice. But hitting their bottom line will. 40% of the Voice’s content is advertising. So how about we call for higher standards of social responsibility from advertisers and call for companies to pull their ads from The Daily Voice and Die Son until such time as we see a marked difference in their reporting on women and violence. Too often, South Africans underestimate their power to influence the media and public opionion and social norms. We can be activivists and advocates, reformers and revolutionaries – empowered to forge, and form, and frame. Instead, we become passive consumers of media and of mindsets. 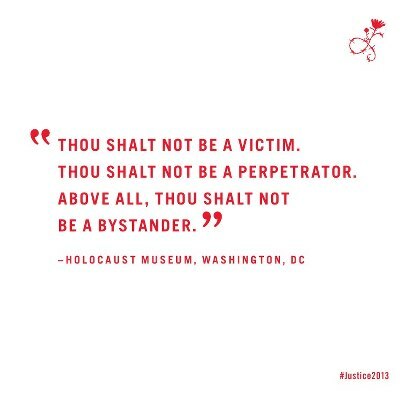 We become bystanders, then victims and, inadvertently, perpetrators.